The offer that finally convinced me to get a Disney Visa card was the $200 gift card offer -- charge at least $500 to your Disney Visa card in your first 3 months and you get a $200 Disney gift card! How easy is that? I use my credit cards for everything, so I can rack up $500 in a week! I've also seen introductory offers for a $100 Disney gift card and a $50 Disney gift card, which are still pretty sweet deals. Obviously the $200 gift card is the best offer, but I can't guarantee you'll get the same offer when you apply. Every purchase made with the Disney Visa earns you 1% in Disney Dollars. 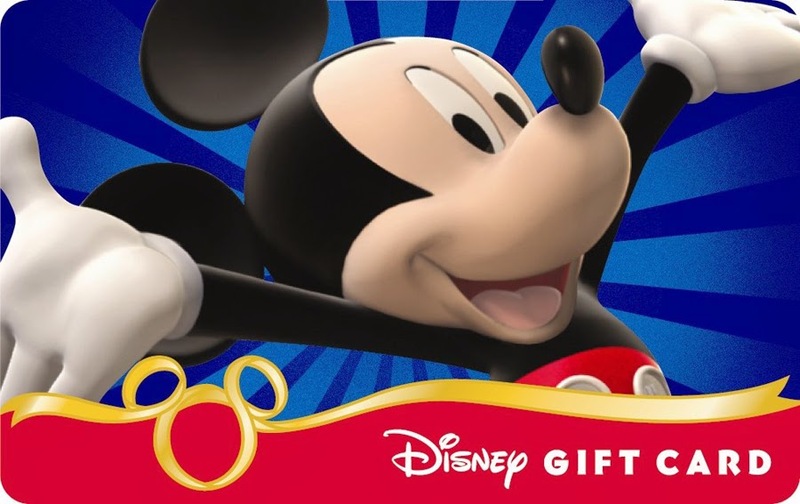 You can start redeeming your Disney Dollars in the form of a Disney gift card when you've made at least $2,000 in purchases (and accumulated at least $20 in Disney Dollars). You'll be surprised how quickly you can earn Disney Dollars that you can spend at the Disney Store or in Disney Parks! I've been using my card for less than a month, and I've already earned about $50 (like I said, I charge everything to my card). This perk is so cool, it deserves its own paragraph! 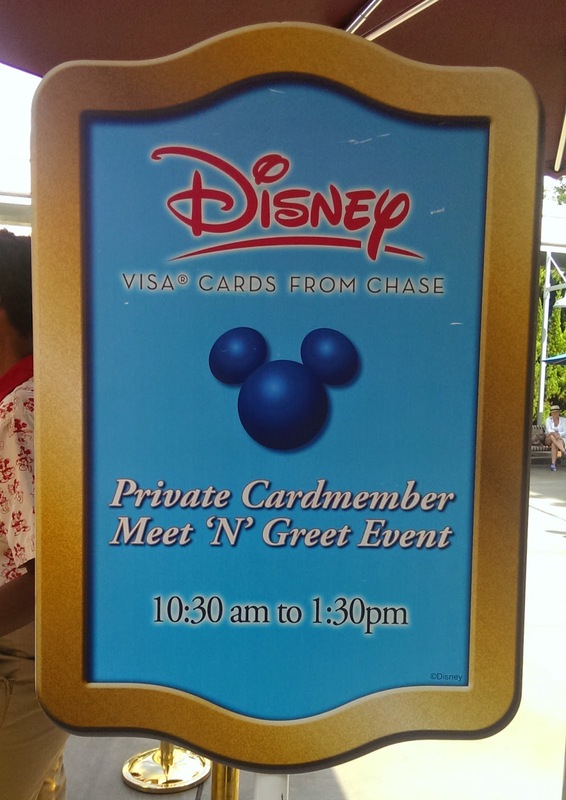 Disney Visa Cardmembers get a special meet-and-greet character session AND a free 5x8 souvenir photo. You can do this once per day. Per day!! 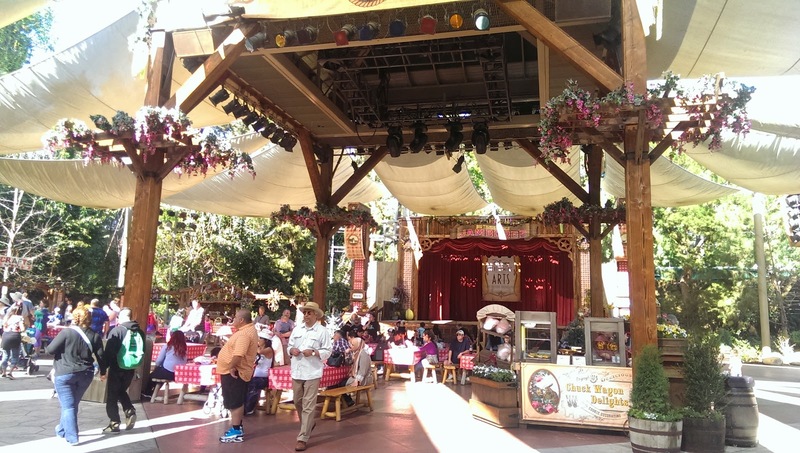 The Disneyland Visa meet-and-greet is located in DCA's Hollywood Land, and it is open between 10:30am and 1:30pm. 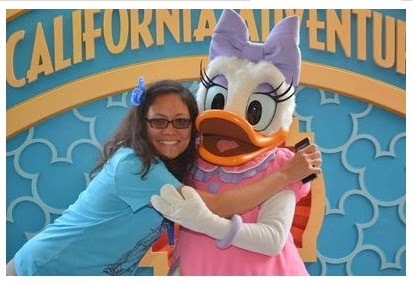 When I was there, the characters alternated between Daisy, Stitch, and Minnie, changing every 20 minutes. I highly recommend getting there early, because the wait can get long. 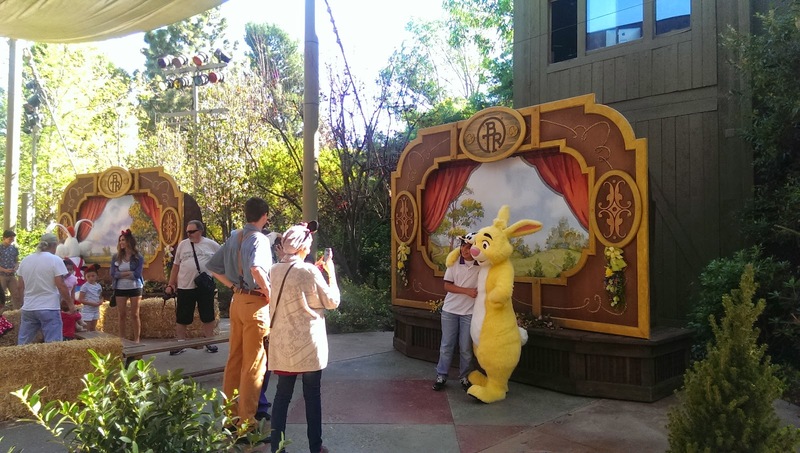 Yes, only Cardmembers can line up, but Cast Members let them spend more time with the character so it's a more personal (but time-consuming) experience. In addition to the year-round perks, Cardmembers get special limited time perks such as special ticket packages for Aladdin on Broadway, discounts with the Disney Movie Club, and limited edition trading pins just for Cardmembers. I couldn't resist taking advantage of the trading pin offer, and bought a 2015 Disney Visa exclusive Captain Hook's Treasure Chest pin. The pin features Hook and Smee, and it has flashy jewels and "Visa Cards from Chase" printed on the pirate flag. It's so cool, and I can't wait to see the 2016 version! You love Mickey on your shirts, mugs, hats, bags... why not on your credit card! I went with a classic Mickey design, but there are other cute card designs featuring Minnie, Cars, Toy Story, Tinkerbell, Nemo, the Fab Five, and more. You get all these benefits, with no annual fee! If you like Disney, and especially if you like going on Disney vacations, the Disney Visa card is a no-brainer. The only question is whether you should get the Classic (no annual fee) Visa card or the Premier Visa card, which has a $50 annual fee, but earns you 2% for purchases made at restaurants, gas stations, groceries, and Disney locations. The Premier Visa also lets you redeem your reward points for airline travel. Using a Disney Visa Card to help offset the cost of your Disney vacation is a great money saving tip, and it's one that I intend to add to any list of tips I offer for ways to save money on a Disney vacation! Garlic bread is easy to make -- but any recipe that calls for minced garlic can be a real pain. Peeling and mincing garlic is not one of my favorite tasks (not to mention cleaning my hands and utensils afterwards), so I often rely on pre-minced garlic. 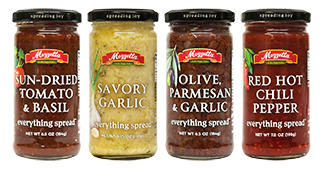 Now, Mezzetta Foods, best known for their jarred olives and pickled peppers and specialty Italian jarred foods, has come up with something even better: a Savory Garlic Spread! It's all part of their new Everything Spreads line, which features savory ingredients blended into a ready-to-use spread. These spreads are great to add to your favorite recipes (or just a slice of bread!) to give it a burst of flavor. There are four varieties: Sun-Dried Tomato & Basil, Red Hot Chili Pepper, Olive Parmesan & Garlic, and Savory Garlic. 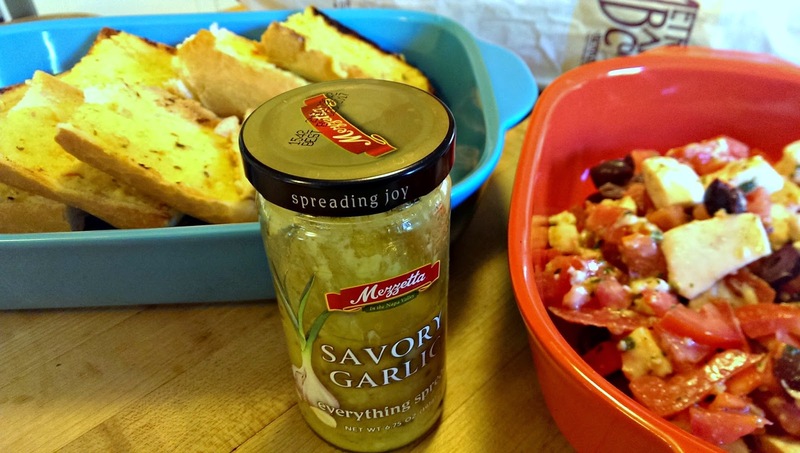 We received samples of Mezzetta Everything Spreads and we can't wait to try them all! First up: the Savory Garlic spread. 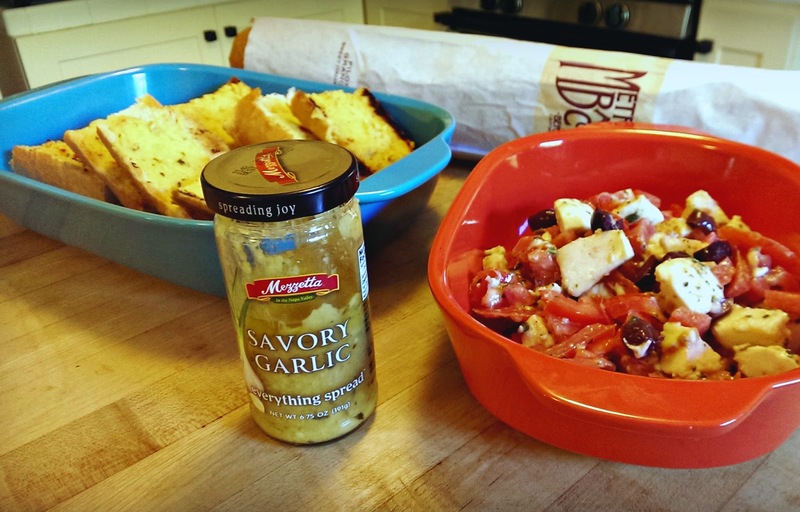 We used it to make the easiest, most delicious garlic bread ever! Just spread butter on a baguette, then spread some Savory Garlic on top, then broil. Served it with a caprese salad, it makes a wonderful meal. • Make ballpark garlic fries. • Add to mashed potatoes. • Spoon over garden vegetables. • Make garlic butter for steak. Savory Garlic is such a versatile spread, I had no problem coming up with 5 suggestions of my own! • Use to make garlic fried rice. • Brush onto grilled and buttered corn. • Brush onto grilled chicken. • Brush on top of homemade bread rolls or biscuits before baking. Basically, you can use the Savory Garlic spread on everything you would use minced garlic -- without all the fuss of mincing your own garlic. Imagine the possibilities when you have all four flavors in your pantry! You can find Mezzetta Everything Spread at West Coast Safeway stores, Kroger and Raley's stores, and H.E.B. in Texas for about $3.49. Happy cooking (and eating!)! Disclosure:I received product samples for review. The views and opinions expressed here are my own. The main area still retains its down-home country feel, but there's a springtime feel, with touches of pastel in the flowers and the decor. Guests can take part in special Easter themed crafts like decorating your own Easter eggs. 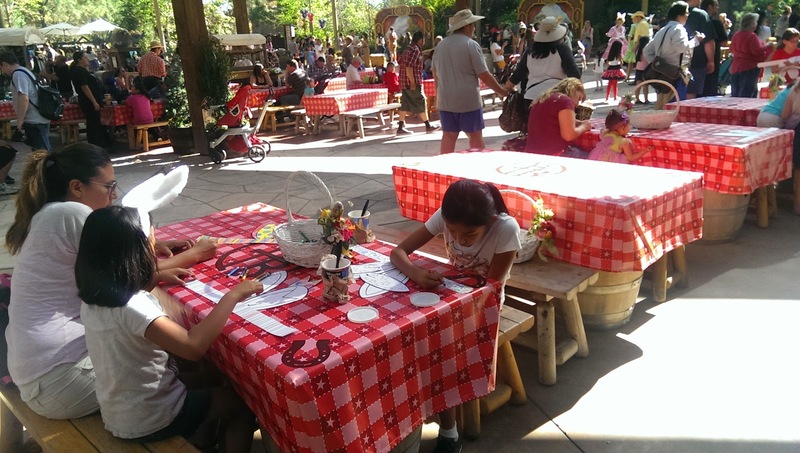 There are crayons and coloring crafts strewn around the tables for kids to enjoy. There's a hoedown with musicians and dancers (love the pastel-checkered outfits!) teaching kids the bunny hop and other country dances. 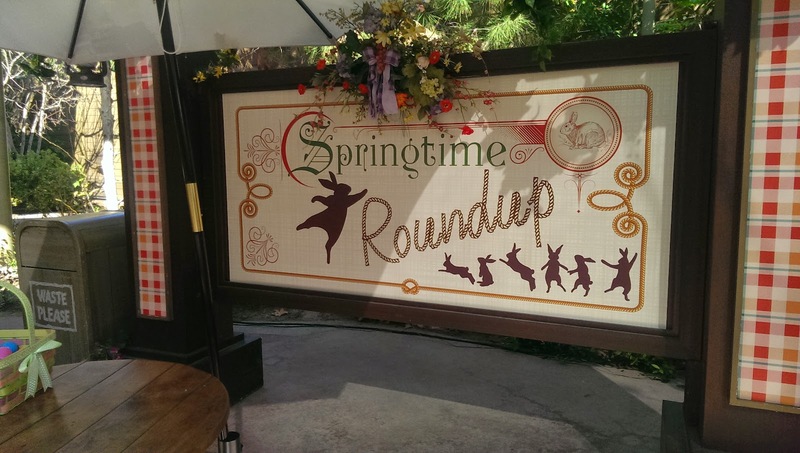 Character meet-and-greets at the Springtime Roundup include Rabbit from Winnie-the-Pooh, Roger Rabbit, the Easter Bunny, Thumper (see the bunny theme? ), Pluto (with bunny ears! 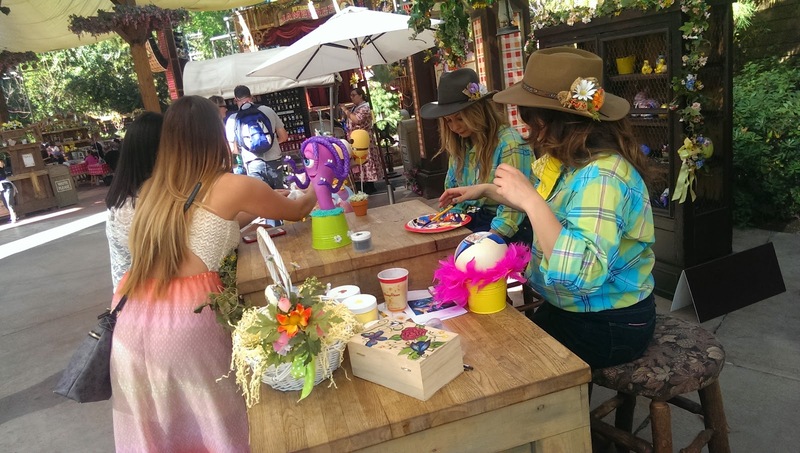 ), Jessie from Toy Story, and of course Minnie and Mickey in their springtime cowboy outfits. Even though it was the very first day, the lines to meet the characters did not seem to long, probably because Big Thunder Ranch is out of the way. 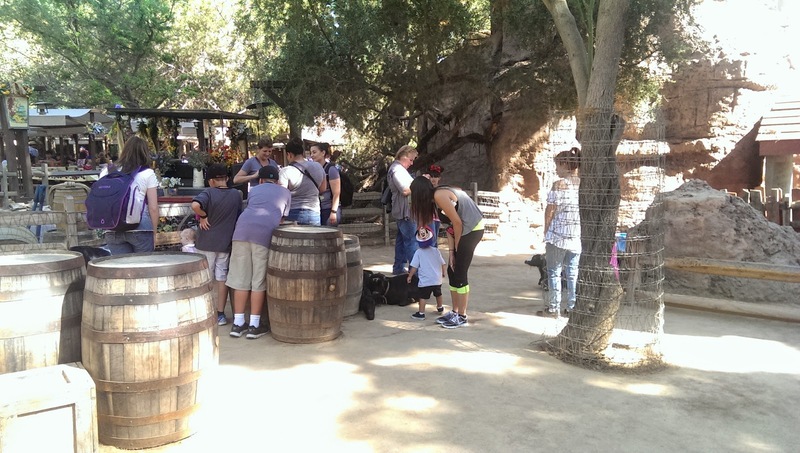 Of course, it wouldn't be Big Thunder Ranch without the petting zoo and donkey pens! 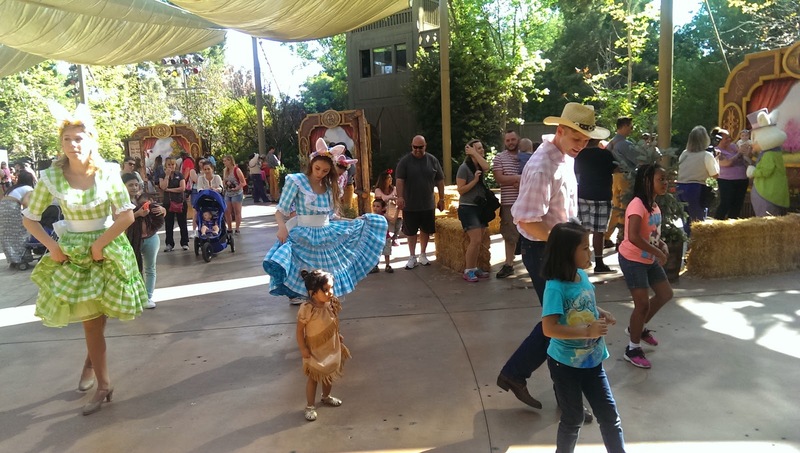 The Springtime Roundup ends April 12, so grab yer pardners and mosey on down to Big Thunder Ranch and join in the fun. chocolate that melts in your mouth when dipped into a hot drink! My favorite flavors are Salted Caramel and Turtle Pecan, but there's a flavor for every taste: traditional "plain" almond, plain with toffee bits and almonds dipped in chocolate, plain with cherries and almonds dipped in chocolate, lemon, chocolate almond dipped in chocolate, chocolate almond with chocolate chunks dipped in chocolate. Yum! Of course, we also love eating Nonni's Biscotti right out of the box! 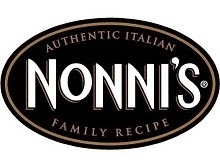 How do YOU like eating your Nonni's Biscotti? Disclosure: I received samples for review. The views and opinions expressed here are my own. My family loves Mexican food, and we arere lucky to live in California, home to some of the best Mexican food in the US. But there are times when I can't be bothered to eat out. I can whip up an enchilada casserole or taco spread, but I just can't get that authentic taste -- plus, there are just some dishes I won't even try to make, like tamales or chile rellenos. Enter Del Real Foods. You may have seen their carnitas at CostCo; they're a family-owned business that specializes in authentic prepared Mexican foods. Their heat-and-serve dishes are made from scratch, with traditional ingredients, using family recipes. They're a great option for a delicious Mexican meal at home. Last week, Del Real sent us some samples of their dishes -- and boy, has it been a Fiesta in our household! 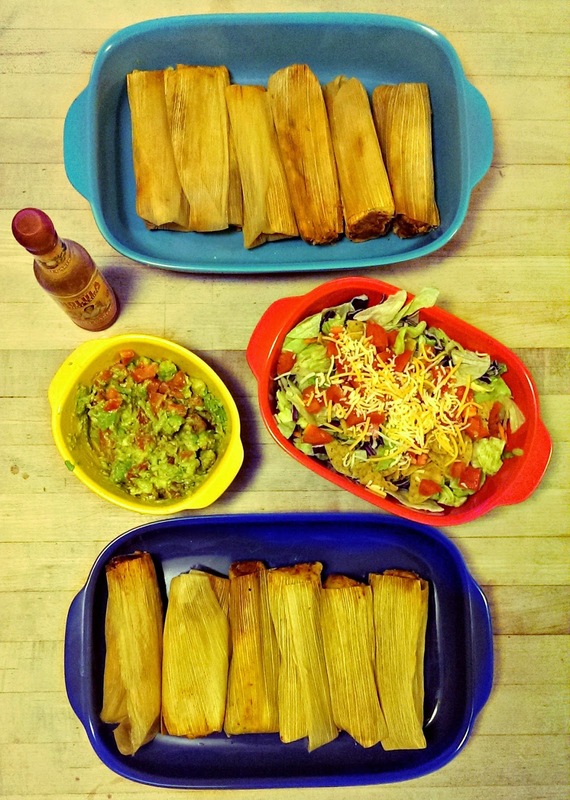 So far we've feasted on two kind of tamales, and we are definitely hungry for more. We all love tamales, but there's no way I'm ever going to attempt making them. 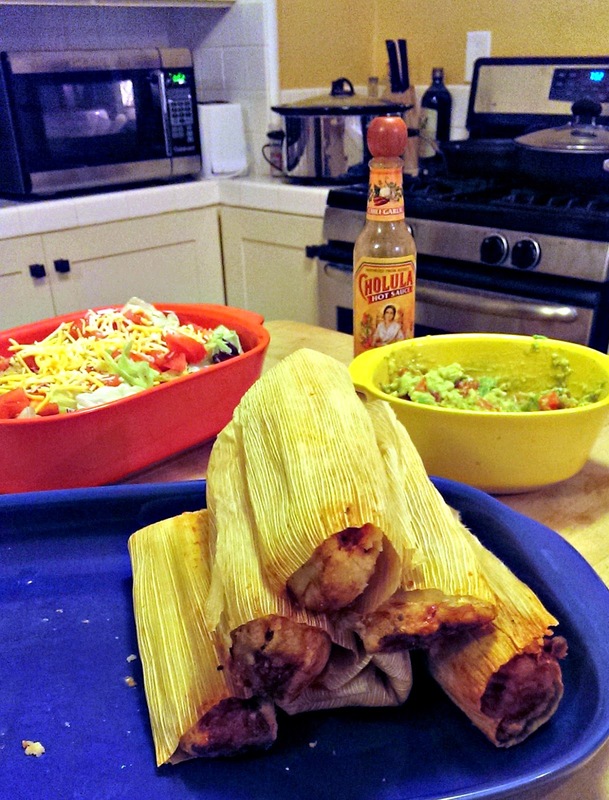 It's just too much work to make the dough, wrap individual tamales in corn husks, and steam them for ages! I don't even have a steamer! With Del Real Tamales, I don't have to. They come in packs of 6, and all you have to do is cover them with a wet paper towel and heat them in the microwave. Del Real tamales are sooooo delicious! The dough is soft and moist, the meat is tender (we've tried their chicken and pork tamales), and the sauce is flavorful. They are surprisingly filling, so just 1 tamale (or 1.5 if you're really hungry) with a scoop of guacamole and a salad will fill you up nicely. These tamales freeze well, and leftovers will keep in the fridge for about 3 days -- not that you'll ever have leftovers. 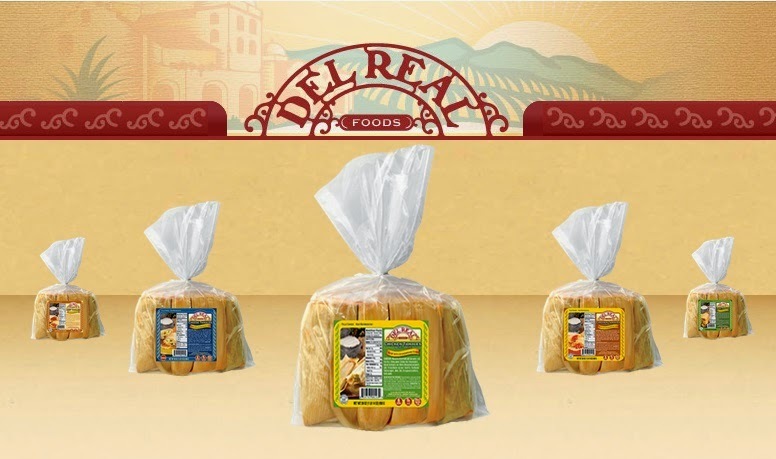 Del Real Tamales come in 6 varieties: Beef, Cheese & Green Chile, Chicken in Green Sauce, Chicken in Red Sauce, Pork, and Sweet Corn. You can find them online at www.mexgrocers.com and in select grocery stores like Safeway, CostCo, (check their online store locator). I'm definitely going to be hunting down Del Real tamales from now on -- I've found my go-to heat-and-eat Mexican food! 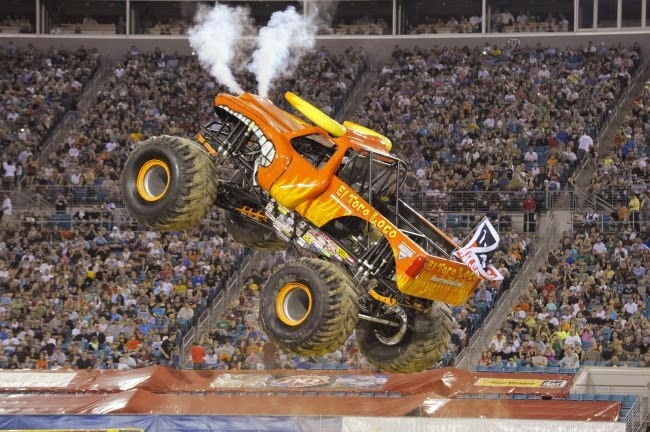 It’s the Monster Jam at Levi’s Stadium in Santa Clara on April 11th, 2015!! 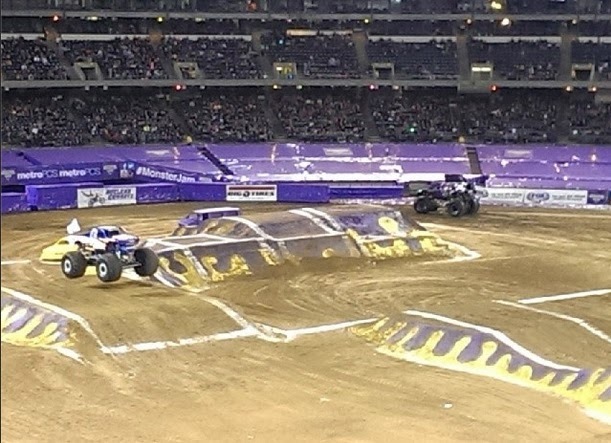 We watched Monster Jam last year and we had a great time watching Grave Digger, Stone Crusher, El Diablo, and more race, spin, slip, and crash! It was absolutely crazy! This time, not only do we get to enjoy the Monster Trucks, we also get to see Levi's Stadium, the new home of the 49ers, which is almost brand new. I can't wait! Come join the fun at Levi’s Stadium in Santa Clara on April 18th, 2015! Buy your tickets online at Ticketmaster or Monsterjam.com. Disclosure: I am a Feld Family Ambassador, and in exchange for my time and efforts in attending shows and reporting my opinion within this blog, as well as keeping you advised of the latest discount offers, Feld Entertainment has provided me with complimentary tickets to Feld shows and opportunities to attend private Feld pre-Show events. Show information (in italics) is provided by Feld Entertainment. The views and opinions expressed here are my own. The views and opinions expressed here are my own. I participated in an Influencer Activation on behalf of Influence Central for GoodNites* TRU-FIT*. I received a promotional item to thank me for participating. Can you spot the bedwetter in this photo? Of course you can't -- and that's because any kid can be a bedwetter. Bedwetting, or nocturnal enuresis, is a lot more common that you think, and many children who are fully potty trained have trouble holding their urine at night. Doctors don't really know what causes it, but theories include hormonal problems, bladder problems, sleep problems, and genetics. My husband was a bedwetter, and I guess he passed his weak bladder on to one of our kids. Fortunately the problem didn't last long. In fact, bedwetting usually goes away on its own, and 15 out of 100 kids who wet the bed will stop every year without any treatment at all. Actually, bedwetting is a fairly common condition. 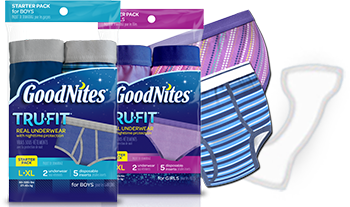 According to a GoodNites® brand study, it’s estimated that 1 in 6 children between the ages of 4-12 in the United States suffer from nocturnal enuresis, more commonly known as bedwetting. With training, bedwetting can be "cured"
The GoodNites® brand study also found that 43% of parents incorrectly believe that bedwetting can be “trained” out of a child. Bedwetting is a medical condition. Doctors and parents can suggest strategies to help the child cope, such as minimizing liquid intake before bed, and setting nighttime alarms to wake the child up and remind him to go to the bathroom. However, bedwetting is not something that the child can be trained out of. The condition can be frustrating, but parents of bedwetters should remember that it is not the child's fault. If your child is a bedwetter, assure him that he does not have to go back to diapers! They don't have to suffer through soiled sheets and pajamas, either. GoodNites® brand has developed a completely new kind of bedtime protection: GoodNites* TRU-FIT* Underwear. What is GoodNites* TRU-FIT*? It's real underwear for boys and girls with a disposable, absorbent insert. 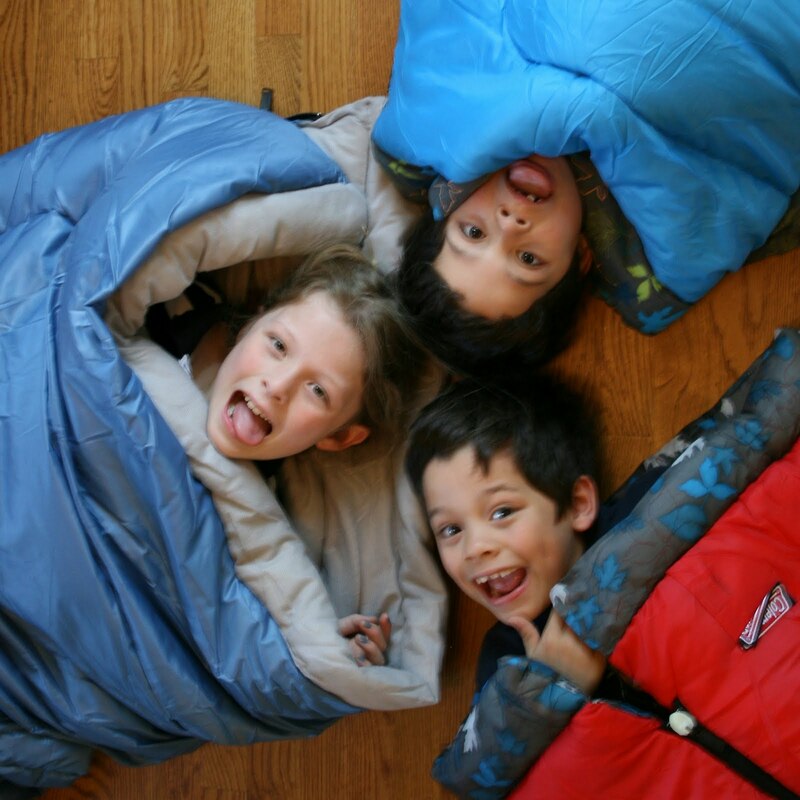 The disposable insert helps keep PJs and sheets dry all night. The underwear looks and feels just like real underwear because it is real underwear, which means that kids can feel more confident about going on sleepovers with friends or cousins and feel like one of the gang (and their parents worry less!). GoodNites* TRU-FIT* is available now at select national retailers for purchase. The underwear is available in sizes S/M and L/XL, for boys and girls. The underwear comes with a disposable, absorbent insert – designed to protect sheets and PJs all night. Check out all the GoodNites* TRU-FIT* at Walmart, and download a GoodNites* TRU-FIT* coupon for $2 off at http://www.goodnites.com/our-products/goodnites-trufit/. Disclosure: I participated in an Influencer Activation on behalf of Influence Central for GoodNites* TRU-FIT*. I received a promotional item to thank me for participating. The views and opinions expressed here are my own. Summer is almost here! Well, at least that's how it seems to grownups. To me, summer will be here before we know it, and I'm already frantically planning camps and trips and activities. But to a kid, summer is still far, far away. It's about 12 weeks away.... how in the world is a kid supposed to fill up the weeks between now and summer? 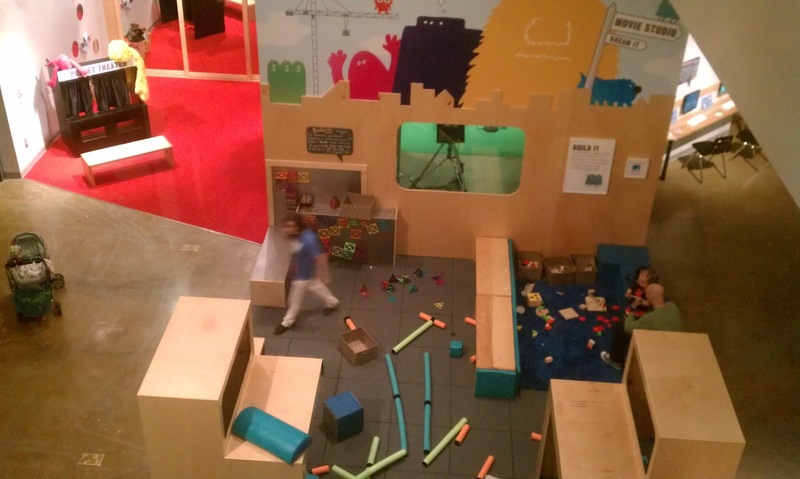 Enter Red Tricycle, your go-to site for discovering the coolest places to play, eat, and explore with your kids. I'm excited to announce that I've joined the Red Tricycle writing team, and I'll soon be posting about all the Must-Gos, Must-Eats, and Must-Dos around Silicon Valley. I'm also excited to announce Red Tricycle's new 12 Weeks of Awesome Family Adventures campaign! 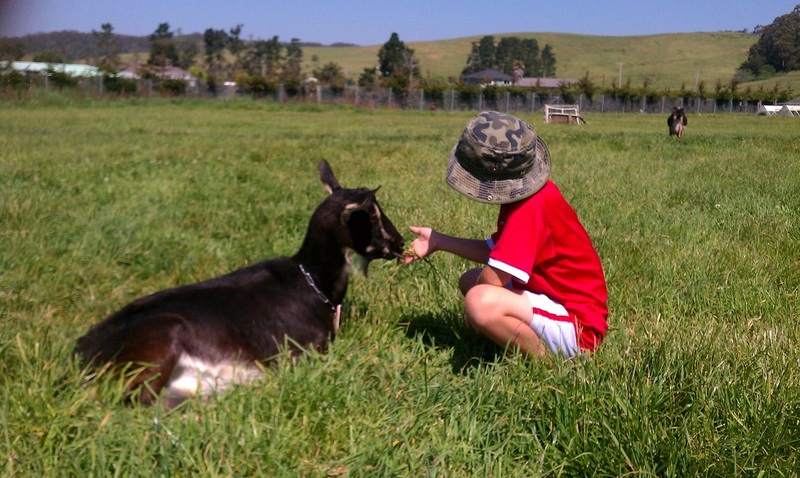 Red Tricycle has partnered with some of the most popular family attractions around the Bay Area to offer amazing experiences each and every week between March 14 and May 30. What's more, for every transaction, Red Tricycle will donate $1 to KaBOOM!, a national non-profit dedicated to bringing balanced and active play into the daily lives of all kids, particularly those growing up in poverty in America. 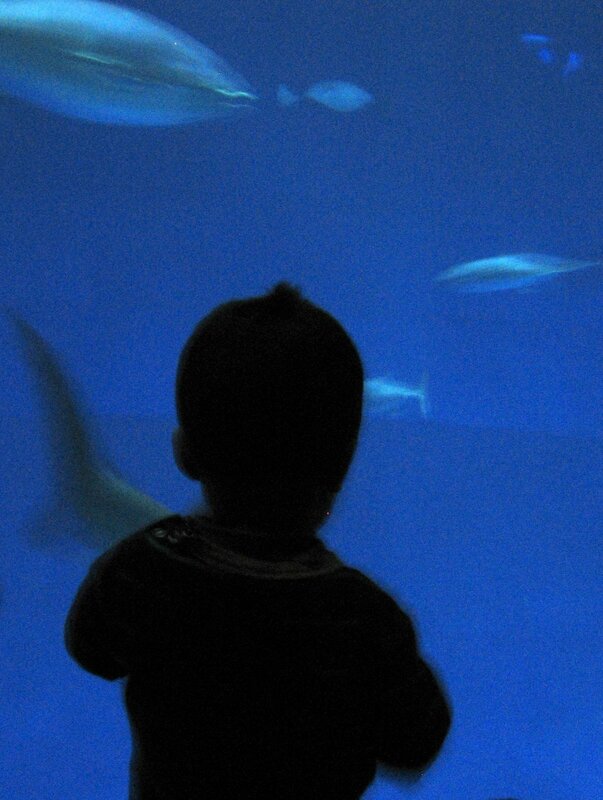 What an amazingly easy way to experience the best that the Bay Area has to offer and make some memories with your family! Ready to start your #12WeeksOfAwesome? Check out the events below and buy your tickets to reserve your spot. You can book online or via the new Red Tricycle App. The app makes it easy for parents to find awesome family adventures and easily book them with two clicks through native Apple Pay integration. The app is available on iTunes Store. There's a reason why the price of roses triples during Valentine's week, and a reason why romantic movies feature roses. The rose is the classic symbol of love and sensuality. Pretty much everyone loves the heady fragrance of a rose petal. That's why there's nothing more romantic than having rose petals strewn on your bed, and there's nothing more indulgent than having rose petals scattered in your bath water. That's why the new body wash collection from Caress is so brilliant. The Caress Forever Body Wash Collection features 2 rose scents that feel incredible on your skin. Even better, thanks to Caress' new Touch Technology, the scent lasts for up to 12 hours! 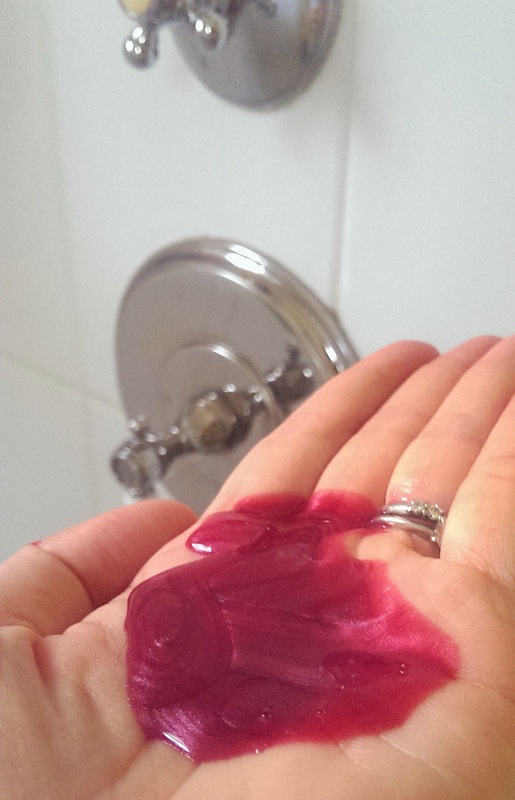 As a busy mom of 3, I don't have much time and money for pampering myself. It's a well-known Mom Life Hack that you get most of your privacy in the shower, and that's certainly the case for me! A long (and I mean looong) hot shower is one of the few times in the day when I can relax and unwind. I've always loved fragrant body washes, and Caress Forever Body Wash is right up there with the headiest perfume. And the scent does last! It's like I've sprayed perfume on my skin. When you touch your skin, the scent gets stronger -- kind of like a human scratch and sniff! Fortunately, my husband loves the scent too. He's not a fan of fruity scents, he likes deep, floral romantic scents just like Caress Love Forever Body Wash. In fact, the only thing I don't like about Caress Forever is the shape of the container -- I prefer the top cap to be flat, so I can store it upside down and get each and every last drop of the body wash! You can find Caress Forever Body Wash at CVS, Walgreens, Safeway, and other pharmacies, supermarkets and retailers for about $5.99 per bottle. Stock up and get ready to indulge your senses! Disclosure: This is a sponsored post. I received product samples to facilitate my review. The views and opinions expressed here are my own. Disney's Cinderella was one of the first animated movies that I knew by heart. When my grandmother bought her first VHS player (actually it was a Sony Betamax -- remember those? ), Cinderella was one of the few movies she bought. I was about 7 years old. My cousins and I watched it every weekend for years (or at least it seemed like years!). I memorized each and every line of dialogue and song. The story is pretty much the same, so you don't have to worry about spoilers. Where the new movie differs is in emphasizing different parts of the story. The new movie gives a lot more time to the backstory, showing Cinderella (or Ella, as she was called) growing up with her mother and father. Seeing Ella's enchanted childhood makes her subsequent misfortunes even more heartbreaking. Also, the mice aren't given as big a role -- they don't talk like they did in the cartoon, but they still have personalities that will make the audience laugh. The costumes are probably my favorite thing about the movie. They were amazing to look at, so colorful, elegant, and timeless. 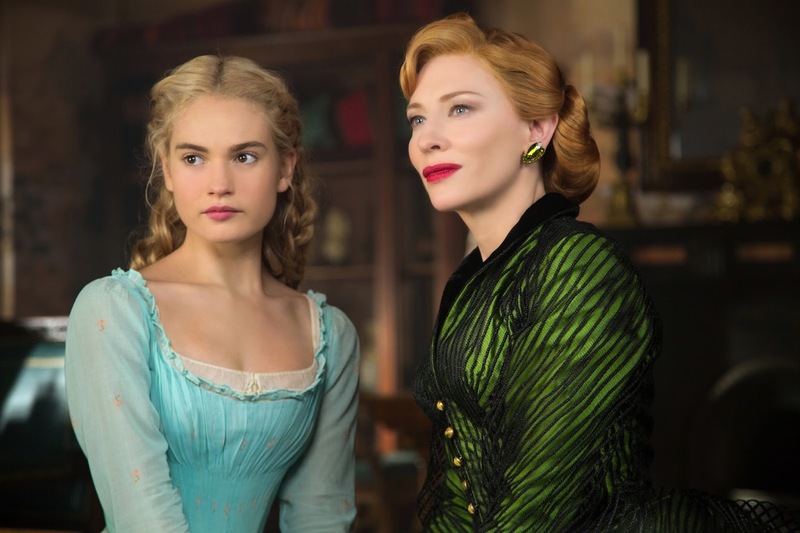 The wardrobes of the main female characters were perfectly suited to their personalities -- fluffy and flouncy for the fairy godmother, colorful and fussy for the stepsisters, severely elegant for the stepmother (Cate Blanchett as Lady Tremaine looked amazing!! ), and soft and flowing for Cinderella. The original Cinderella is generally believed to have been set in France, and judging from the presence of horse-drawn carriages and powdered wigs, it's sometime in the 1700's -- so everyone you see (like in the original cartoon) would have been white. 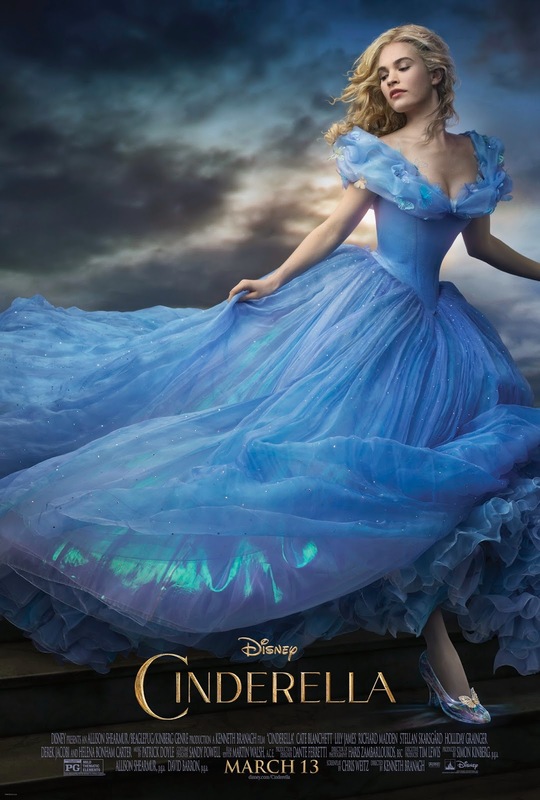 The new Cinderella film features a more diverse cast; I was happy to see people of Asian, African, and Mediterranean descent throughout the film. I always hated the name Prince Charming, and I was so happy that the new movie actually gave the prince a decent name! Kit was played by Richard Madden, who in my opinion wasn't exactly swoon-worthy, but played his part really well. I'm glad the writers gave him an actual personality, more like the modern Disney princes than the stuffed-shirt princes in Snow White or the original Cinderella. The original Cinderella was all about having faith and dreams coming true. 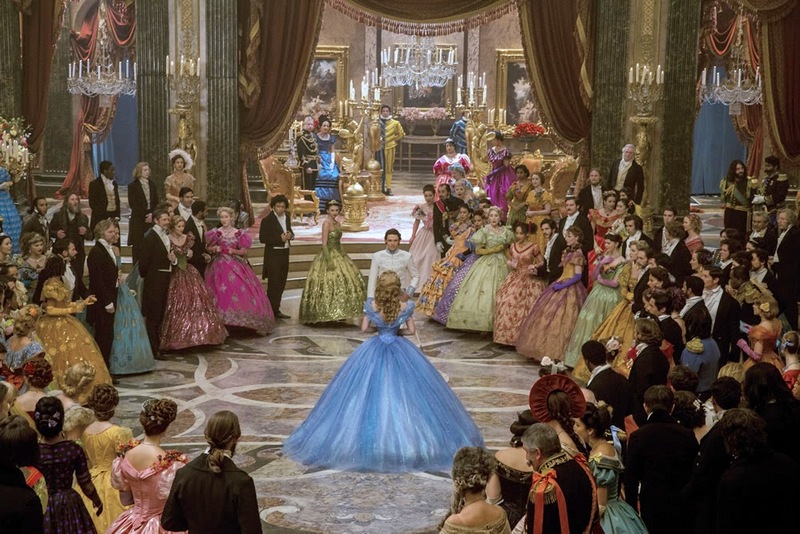 The new Cinderella movie has a far more substantial -- and far better -- message. Right from the beginning of the movie, Cinderella's mother teaches her to "Have Courage and Be Kind". This is the mantra that Cinderella carries with her throughout the movie. It guides her actions and thoughts, and it's what ultimately sees her through. I can't think of any better motto to have! Disclosure: I was invited to a press screening of the movie for review purposes. The views and opinions expressed here are my own.